The Pick: I've had to admit to being shallow on at least a few different occasions in my life, several of which were explaining previous movie picks for this Shocktober 2017 season. It should come as no surprise then, dear reader, that House on Willow Street was chosen based solely upon the strength of its poster art. More accurately, I chose this film based on the font choice on said poster. Look at that font! 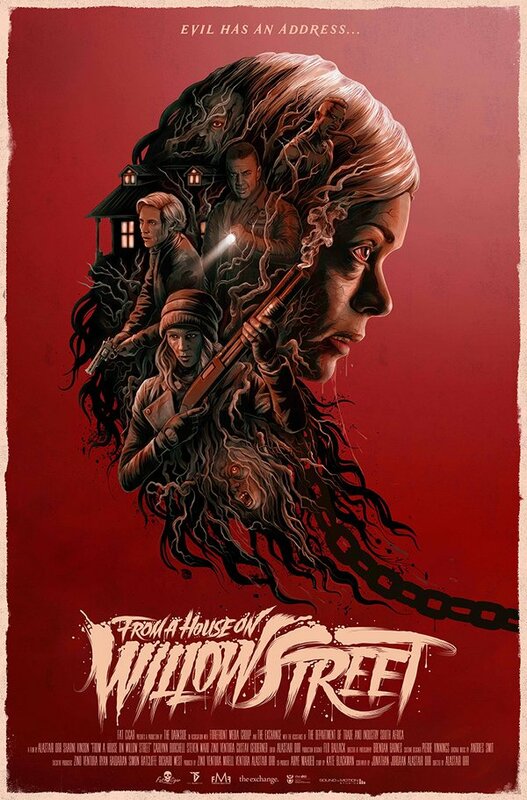 The Film: House on Willow Street has quite the premise; do try to stay with me on this one. A group of criminals plot to kidnap the daughter of a business man who has access to diamonds. Said criminals successfully kidnap said girl, and bring her back to their warehouse lair where they go about filming a ransom video. The kidnappers then experience difficulty contacting the girl's parents. They return to the house from which the girl was kidnapped only to find that the girl's parents are dead. They also find a video tape which shows them that the girl is possessed by a demon and that she killed her parents and also a couple of priests. Then the girl suddenly starts acting possessed again. Also, there are other ghosts. Oh, and one of the kidnappers has a heart of gold. Guess who survives? You cannot accuse House on Willow Street of not trying. From the overly complicated story, to the grotesque special effects, to the stylish and gritty cinematography, this film is really trying to hit on all cylinders. The only problems is it's trying way too hard to hit above its weight class. The acting can't quite keep up, and the story never resonated. Also, I have difficulty being sympathetic towards kidnappers, hearts of gold or not. The protagonists really earn everything they get. That said, this is not a simple demon possession story. No, like everything else in this film, Willow Street has to up the ante to the extreme. There's nothing short but the FATE OF THE WORLD at stake! You see, the demon possessing the girl is a very bad, terrible demon! One that consumes the souls of people! And it grows EXPONENTIALLY more powerful for each soul it consumes! And it only needs FOUR SOULS to... to... WALK THE EARTH! So despite the hamfisted exposition delivered via videotape, I never got the impression that the demon actually became more powerful with each soul it consumed. By the climax of the film, the demon needs only one more soul to complete its barbershop quartet of DOOM, but feels just as powerful as it did before. I mean, if you can choke a person with a super-strong, invisible force power, why not just hold them still while you eat their soul? Or, at the very least, why not use your Sith powers to break your restraints? Is this somehow breaking demon hospitality rules? Also, I guess I don't understand how possession works in this film. The demon's stated goal is to consume four souls. Somehow this correlates with putting some sort of tentacle appendage down a person's throat to possess their body. I'll let this one go, and I will presume that in the lore of this film, possession equals soul consumption. However, one of the kidnappers is somehow possessed by playing tentacle-tonsil-hockey with the ghost of his dead mother. Admittedly, french kissing your mom, dead or not, is probably a sure-fire way to kill your soul, but how this counts as a soul consumed by our demon friend is never addressed. Again, it could just be that my definition of demon possession is too narrow for the lore of this film. While the demon is said to manifest our worst fears to gain power over us, and it could be assumed the ghost of this guy's dead mother is a manifestation of the demon, this is the only possession in the film that works this way. No other possession is done via a proxy entity. No other possession is done via long distance. How this demon is able to possess a guy that is somewhere in the middle of the woods while the demon itself is chained up in some warehouse is never addressed. And, really, if the demon can possess people this way, why does it matter that it's physical body is chained up in a warehouse? Why not just possess four people via satellite and be done with it already? You know what else bothers me? I don't like my own explanation that the dead mother's ghost is simply a manifestation of the demon created with the express purpose of possessing her son. There are other ghosts in the film and none of them ever try to possess anyone. In fact, one of the ghosts ends up being there to help. You know what? None of this makes any sense, and I'm thinking about it way too hard.